I am going to do this entry in 2 posts. I could not sleep so I decided to make my tags for the scarves and get them bagged and ready to go. So that is indeed what I did. 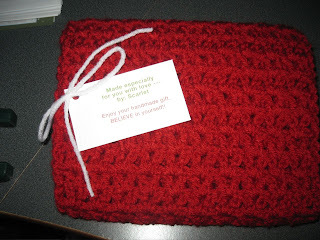 Here is a photo of one of the scarves with the tag I made. 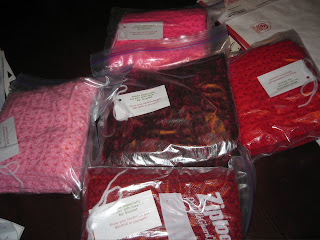 I'm also adding the photo of the 5 scarves that I made for the Red Scarf Project all tagged and bagged. Remember to keep Crocheting those Memories!! Love what your tags say and the packaging is so very nice.